The children at Arundale Primary School are proud of being part of the school. The governors, parents and staff together believe that wearing a simple school uniform enhances this feeling of belonging. 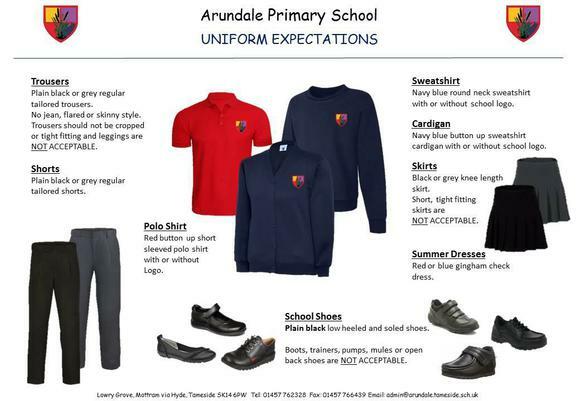 Below is a link to Tesco's website, where you can buy Arundale's school uniform, with our logo embroidered on clothing. Also Tesco will donate 5% of sales on products bought from our page in cash to Arundale. Grey or black skirt or trousers, with a red polo-shirt and school sweatshirt or cardigan. In summer, children can wear blue and white checked dresses (not sun dresses). Black shoes as described in our prospectus below. The school PE kit consists of black sports shorts (not cycling or leisure shorts) and a plain white T-shirt. (Motifs of any sort are not allowed). Children will also need a pair of plain black pumps. This kit should be kept in a bag and should all be named.